The Western Ghats is a stretch of the mountain range that runs along the western ridge of the Indian Peninsula. Also known as Sahyadri, these mountain ranges are blessed with natural beauty in abundance. Sahyadri literally translated to "The Benevolent Mountains" and that is the impeccable description of these ranges. Bestowed with waterfalls, lush green forests and wildlife, the Western Ghats are truly what it means to be in a land that is heaven on earth! It is, therefore, a part of the UNESCO World Heritage Site. Naturally, the regions through which the Western Ghats run are places that simply cannot be missed. It trots through the states of Tamil Nadu, Kerala, Karnataka, Maharashtra and Goa. These states are, therefore, home to some of the most breathtaking hill stations of India. Climatic conditions in these hill stations are mostly pleasant throughout the year, except monsoons, which might have light to heavy rainfalls. Even so, summer might be the ideal time to visit them. While the other parts of these states might have scorching weather, the hill stations will be the perfect escape to beat the summer heat. Here are some of the best hill stations of the Western Ghats that must be visited. Being India's smallest hill station, Matheran is located in Raigad district of Maharashtra. Since it is just 80 km from Mumbai, it is a popular tourist destination for the city folks. Matheran literally means "forest on the forehead". Here, it refers to the forehead of the mountains. Matheran is filled with scenic viewpoints that will simply leave you spellbound, to say the least. There are about 38 viewpoints, some of which are One Tree Hill Point, Louisa Point, and Porcupine Point that offer a panoramic view of the plains below them. The Toy Train of Matheran, Mount Berry and Charlotte Lake are some of the other places of interest here. Mount Berry is a popular spot near Matheran since it gives a panaromic view of the valleys and peaks of Matheran, also a scenic view of the Neral town which is located 8 km from Matheran. Mahabaleshwar is a package that contains all of mother nature's gifts. With serene lakes, refreshing waterfalls and lush evergreen forests, Mahabaleshwar makes for a perfect holiday destination. It is located in the Satara district of Maharashtra and used to be the summer capital of the British Raj. Venna Lake, Lingmala Waterfalls, Krishnabai Temple and an array of viewpoints are some of the most sought after places in Mahabaleshwar. This hill station is famous for its strawberry farms, so don't forget to purchase some of their delicious strawberries! Popularly known as the "Queen" of Maharashtra, Amboli is an awe-inspiring hill station which has a unique flora and fauna, and which is why it is world's one of the ecological hotspots. This less-explored place, located around 100 km from Goa, is famous for its waterfalls and viewpoints. Amboli is known for its incredibly high rainfalls during monsoon. Nangarta Falls, Amboli Falls, Shirgaonkar Point are a few places in Amboli that cannot be missed. It also houses a place of historical significance, which is the Madhavgad Fort. Famous for its coffee estates, Coorg is a beautiful hill station located in Karnataka. Also known as Kodagu, Coorg is a perfect getaway which is eternally misty and pleasant. The headquarters of Coorg is Madikeri, which is also a famous tourist spot. Kodavas are the dominant ethnic group of people here. They have a distinct culture and celebrate a number of festivals such as Kailpoud or Puttari, unique just to their group. 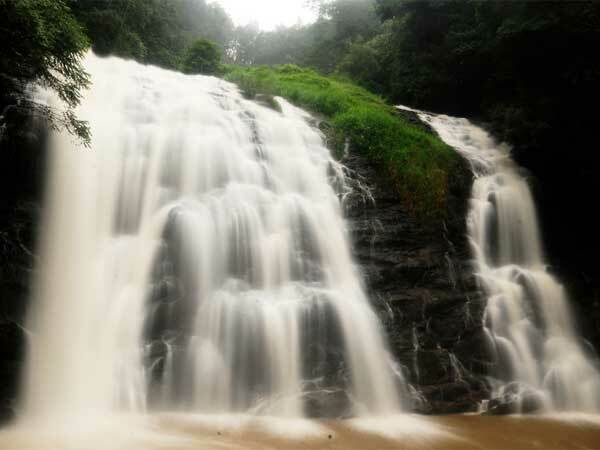 Talakaveri, Iruppu Falls, Abbey Falls and Nisargadhama are some of the places in and around Coorg that must be visited. Carpets of green meadows and rich thickets of forest makes Kudremukh a brilliant bio-diversity hotspot. This hill station is mostly favoured by the folks of Bangalore since it is located in Karnataka. The place gets the name "Kudremukh" since the hills here is believed to have the shape of a horse's face. The Kudremukh Peak is every trekker's delight since it is at an altitude of 1894 m above sea level. Some of the other places of attraction are the Kudremukh National Forest, Hanuman Gundi Waterfalls and Kalasa. Kalasa is a small temple town, located 22 km from Kudremukh. It is known for housing an old Kalaseshwara Temple dedicated to Lord Shiva. The town also has an ancient shrine of Goddess Bhagavathi. Located about 55 km from Trivandrum in Kerala, Ponmudi is an enticing hill station, which literally means "The Golden Peak". The hills of Ponmudi are filled with tea plantations, beautiful cascades and popular peaks. Hence Ponmudi is also a favoured destination amongst trekkers. Golden Valley, Peppara Wildlife Sanctuary and Kallar River are some of the places that must be visited in Ponmudi. The popular routes for trekkers in Ponmudi are Bona Falls, Kalarkad Falls and Chinnappulle to name a few. The pristine hill station of Munnar is located in Idukki district of Kerala. The fresh aroma of spices, tea plantations, acres of grasslands makes Munnar one of South India's favourite honeymoon destination! It is believed that the town got its name from the following three rivers - Nallathanni, Muthirapuzha and Kundala. Rose Garden, huge tea plantations of Kolukkumalai, Echo Point, Mattupetty Dam are the points of interest in Munnar. Since Munnar houses South India's largest tea plantations, don't forget to shop for their tea of exquisite quality! A large chunk of the Western Ghats is formed by the beautiful Blue Mountains, i.e, the Nilgiris. Coonoor is nestled here and is the second largest hill station of the Nilgiris in Tamil Nadu. It is located at a height of 1930 m and is a great spot for trekking. Coonoor is also well-known for its fantastic viewpoints such as the Lamb's Rock and Dolphin's Nose. Other places to visit in Coonoor are Catherine Falls, Law's Falls and Sim's Park. Ooty is one of the most popular tourist destinations in South India. Formerly known as Ootacamund, Ooty is filled with glittering lakes, beautiful gardens and striking landscapes throughout the region. Ooty's famous Toy Train takes you through the vistas of the natural beauty of the town. Pykara Lake and Botanical Garden of Ooty are the famous places that have to be visited. Thread Garden, Tiger Hills, Doddabetta Peak, and Ooty Lake are amongst the many other places of interest.